October is Breast Cancer Awareness month. Over the last several years, this month has become synonymous with the color pink and building awareness for the disease. Each year you see more and more pink – endorsing the campaign on products, announcing a fundraising, promoting awareness and prevention of the disease that affects so many women, even turning buildings pink through their outdoor lighting. I applaud the efforts and would guess awareness of breast cancer is at an all-time high. Recently a friend raised the question “Why pink? Why cookies?” on her social media pages. The conversation blew up, going directions she never anticipated – thoughts on various fundraising efforts and the products used, the connection between cancer and sugar, the commercialization of a disease for business gain, and the efficacy of mammograms … I was intrigued by the different perspectives, all because of a simple pink box containing chocolate chip cookies. I feel confident saying it is unlikely any of these ideas entered the mind of the business when they decided to put those cookies into a pink box. And I am positive there was no ill-will intended. My guess is they felt they were putting their own mark on a national movement to spread awareness and support of breast cancer. Do I know if they were giving a portion of the money raised with the sale of those cookies to a breast cancer cause? No, but the assumption is certainly there. Think about it in terms of why does your organization or business want to support the breast cancer awareness and prevention movement (or any movement, for that matter). Dig in deep and make sure it is relevant to your brand. For a healthcare organization who treats women, the connection is clear. A grocery store might say their reason is clear, too – a larger portion of their customers are women and women are more likely to make the decision of where the family buys groceries so, therefore, it is a logical connection to support breast cancer awareness and prevention. Or maybe one of your founders or long-term employees was diagnosed with breast cancer and as a company, you want to show your support. These are all valid reasons for going pink. Whether your reason is obvious or not, explain the connection as part of your messaging for the breast cancer (or other cause) initiative you launch. When your customers understand the WHY behind your actions and your brand, your brand is seen as authentic and trustworthy. And when they trust you and your brand, they are more likely to support it. Now you’ve decided to launch a “pink” initiative, think carefully about how the pink ribbon is used and positioned for your brand. Are you making a financial contribution? If a portion of the sales is going to research, which charity is your brand supporting? Does the charity have a comparable mission and values? You are contemplating associating your brand with this charity – you want it to be a positive association, not a negative one. With financial support (implied or real), there will be questions: which charity, what percentage and whether the charity keeps money local or “lines the pockets of their executives.” I can’t answer whether there was a planned donation made from the profits of the cookies but it certainly was another hot-button issue for many people. 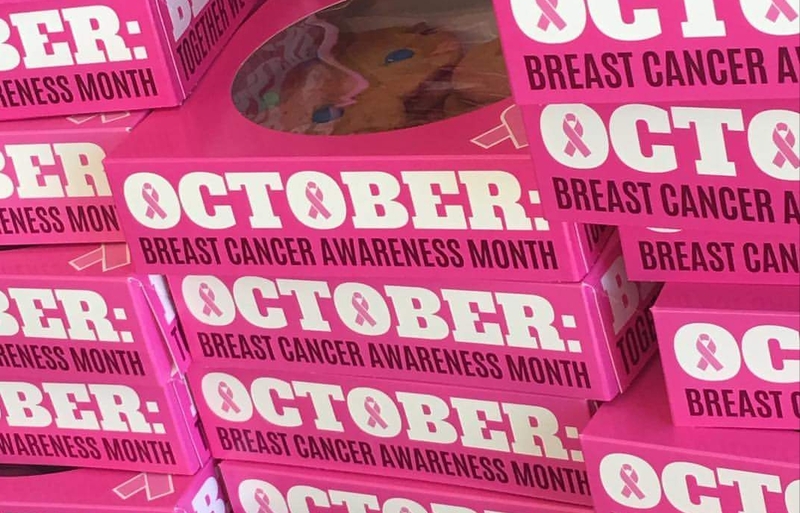 Many brands will simply put a pink ribbon with their logo during October. While it may seem simple to put the ribbon with your logo, the decision should not be taken lightly. Carefully craft your messages to be clear this is an effort to offer support, create awareness, promote preventive actions (such as a mammogram or other relevant screening) or provide financial support to a specific charity. WHAT is the means of support? Be clear on WHAT your brand is doing to generate the support. If it is a product, make sure it is relevant to your brand. Are there any potential negative connections to be made? Going back to my friend’s social media post: several commenters felt the selection of cookies to support cancer (any cancer, not just breast cancer) was a bad idea. Cancer cells feed on sugar (This MD Anderson Cancer Center article was shared as part of the social media discussion: Sugar in Western diets.) One commenter even gave the example of selling donuts, candy bars and other sugary treats to raise money for diabetes research and awareness. This was met with shock, laughter and virtual “palm to the forehead” responses. If it is to promote prevention, make sure the action you support is validated or endorsed by reputable organizations or providers. There will always be a percentage of the population that will not agree or have conflicting opinions but doing your research and having a confident rationale for your brand’s decision to act as it has will go a long way to protect your own reputation. And there will be people who will buy or take your support because of very personal reasons – they know/knew someone with breast cancer and making the purchase is a “feel good” for them or it evokes a memory. Be prepared – at all levels of your organization – to answer the question. It will be asked. Maybe not directly to you or your business, but in some arena or venue “Why pink? Why cookies?” will be asked. Know your answer.